Pictured here Vosges Cosmic Heart Chocolate collection & MARVEL + MOON Tenth Muse candle. Let’s begin our morning, shall we? Mornings can be hard. I am not a morning person. A lot of people aren’t. Maybe you aren’t either. A hard morning constitutes something a little different for me beyond the typical Sunday morning comic strip-style joke—think here of the lovable, yet grumpy, Garfield smashing his fist (paw?) into a ringing alarm clock with the thought bubble I Hate Mondays floating above his cozy cat bed or the frazzled brunette, Cathy, ack ack acking her way through an early morning workout routine before heading off to her drama-filled office job at Product Testing Inc.
See, I have generalized anxiety disorder and depression. Maybe you do too? And even though I get to wake up every morning with the immense privilege of getting to do what I love and am passionate about—write poetry, make candles, and run my own small business—that doesn’t make mornings any less trying sometimes. Maybe you are thinking, Wow, what a problem to have! I am able to work from home. I get to be my own boss. I set my own hours. I’m child-free which affords me time that is so immensely mine. I am able to live the life I want to live and have the career I want because I have had many opportunities to take advantage of to work towards my #goals. I cis, white, straight, and able-bodied. I have had access to education and healthcare, among many other things. I have a loving and supportive family and spouse. I work hard. I have worked hard to get here. I take nothing for granted. I acknowledge my privilege. I also have anxiety and depression which, in and of itself, cares nothing about my opportunities and accomplishments. Maybe you know this feeling too? Maybe you know it all too well. For that, I’m sorry, friend. I’m there with you. So you may be asking yourself what does this have to do with candles? Where do candles come in and why? Well, in this inaugural edition of RITUAL FLAME, a monthly column that explores my personal ritual use of candles as a medium for creativity + self-care + hearthcraft, I want to share with you my morning ritual that helps pull me out of bed on those extra hard days and gets my creativity flowing. I also want to note that I am by no means advocating this ritual (or any subsequent rituals I intend to share in future newsletters) in place of professional mental health care. I simply want to share with you the things that help me in addendum to professional treatment. We got to do all that we can to take care of ourselves, right? We have to find joy and happiness in all the little things, right? (Quick aside for those of you not familiar with hearthcraft—hearthcraft is a facet of magick that focuses on the home, i.e. hearth. Let me share some keywords about this practice from a wonderful writer on the subject of hearthcraft, Arin Murphy-Hiscock—simple, practical, family-related, domestic, everyday, and household. As a person who is constantly battling to manage her anxiety, this facet of magick really attracted me as I often become overwhelmed with having to incorporate yet another thing into my life. You can relate, right? Hearthcraft is a concept that allows me to work with things I already do, spaces I already inhabit, and with objects I already use. Relieving, no? I can add to in whatever way I choose but it is not necessary. (Obvs I do not mean professional mental or medical health care here, that is and can be necessary for many!) So simple, right? Yet, sometimes we need to remind ourselves of this. I know I do. So, the one thing that gets me excited about getting out of bed is the prospect of making coffee, a snap off my favorite dark chocolate bar, and the first match strike of the day as I light one of many candles that will surely be lit throughout my home. Sometimes it is just the thought, Just get up and make coffee. That’s all you need to do. That’s a start. That can be enough, that gets the day rolling. My morning routine goes something like this—pad out to the kitchen still in nightgown and robe, let the pups out into the backyard, fill their food bowls while the romp, play, sunbathe, and then begin the process of making coffee. And for me, it is truly a process. A semi-elaborate ritual that provides me with purpose, patience, and a stimulating sensory experience to start the day. I have been a barista, off and on, for approximately a total of eight years. I first learned to pull a shot of espresso when I eighteen from an eccentric Bulgarian chef at a small European-inspired café where I would be a server for several years into my 20s. My first true ambition and desire at entrepreneurship was to own a coffee shop. All that to say, I love the art of brewing coffee. I love the taste of a gritty cup of Turkish coffee. I drink it black. Coffee, the act of drinking it, the social aspect of it, is attached to many, many memories throughout my life. Good and bad, celebratory and in grief, moments of sheer happiness and in moments of rock-bottom. Maybe you have some memories associated with coffee too? I have several different brewing apparatuses in which to choose from each morning—Hario V60, French Press, a 6-cup Chemex, Hario NXA 5-cup Syphon in addition to two different kinds of goose-neck kettles, an electronic and a hand grinder, and a digtal scale. (I’m also considering adding an Aeropress and a Bee House to the mix.) To me, they do all make a difference in how the coffee will taste and the experience of brewing with each tool is different as well. And, it’s fun to play around with different techniques. I do this by taking some time with the beans. I open the bag, smell them, pick a few up and feel the slick oils grease my fingers. Sometimes I will gently shake the bag just to hear what they sound like. Occasionally, I will even take a bean and pop it in my mouth to taste it. I crunch down and chew it up. · When the water is ready, pour it all over the paper filter, completely soaking it. This helps get rid of any “paper taste” from the filter and also tempers the glass base in which the coffee will be brewed. I also add some hot water to my coffee mug to pre-heat that as well. · Then I empty the glass base of its water, set the Hario on the glass base, add the ground coffee into the filter, and place the whole thing on a digital scale. · This is where the true magic happens—I slowly begin to pour the water in a clockwise direction over the grounds. I add about 100g of water, completely saturating the grounds, and then stop. This is called the “bloom.” I observe the water and coffee bubble and release gases. To me, it is stunning to watch; it is a bubbling little cauldron. The color of the coffee is pleasing in its various shades of black-brown to caramel. The water slowly trickles down into the glass pot. There is something satisfying in hearing the stream of coffee hit the glass base. Smelling the divine aroma signals to my brain that the day is about to start and simply reminds me that the day is wonderful and beautiful because of this small moment. · I keep pouring the water, slowly in clockwise circles, over the grounds until I reach the desired number of grams. I am patient with this whole process. I luxuriate in the whole sensory experience of it. I relish in that first pour from the glass base into my mug. The steam. The very sound of the liquid hitting my cup. The rich aroma. The anticipation of the first sip. I just love all of it. Pre-order MARVEL + MOON coffee mug HERE. I take my cup over to the kitchen table. I collect my matches. I choose a candle I want to lit. Often I start my day off with SELENE. The pleasant night-blooming jasmine fragrance is invigorating, almost startling with its rush of highly fragrant and honeyed forals. It complements the stimulating nature of the coffee. But also, I think I gravitate to SELENE in the morning because this candle represents Selene, the lunar mother goddess. The connection to the moon invites creativity and intuition. The concept of “motherhood” also is not meant to be exactly literal. I always think I lit this candle first thing in the morning when I particularly need help “birthing” a new creative project or to begin some writing that day or even help me “nurture” an on-going project that is already in the works. Selene helps both foster creativity and keep it going. Once the candle is selected, I strike a match. There’s something about the purposeful action of the strike. The hard swipe that brings about a spark. The motion of it, the smell of the sulfur, the quick burst of a small flame and the anointing of fire to wick. It feels so much more. It feels like I am already creating something—I’m creating a space, an environment, a rush of possibility for what can manifest in the day ahead. I love the performance of it, the ritual, the metaphor, the sensory pleasure that accompanies the strike of the match and the lighting of the candle. After I light the candle, I pick up my snap of chocolate bar or small truffle bite and admire it. I smell it. I take small nibbles and then a sip of coffee. I let the delicious coffee melt over the (usually) bitter chocolate in my mouth. (I’m a dark chocolate gal). I hold the chocolate in my mouth and let it soften and dissolve over my taste buds. I let the flavors combine and enliven. As both coffee and chocolate are stimulants, they act as a jolt to my palate and brain. Vosges chocolates are beautiful and good and freakin’ delicious. The airport boutique, my first introduction to the brand, has these towering black, ornate displays carved with detailed design work that feels like you’ve stepped into some Victorian apothecary except the medicine is chocolate. There’s an shimmering chandelier hanging above a single display table that is stocked with lush plant life, heart-shaped purple velvet boxes, glittering amethyst, sticks of selenite, and an array of chocolate bars. I mention Vosges because they recently added another level to my morning ritual of candles + coffee + chocolate. The chocolate is scrumptious and I’m always on the lookout for a new brand to try but Vosges really hit my mark. I mean, it seems so obvious. Yea, sometimes I use stones or crystals in the morning to accompany an occasional tarot card pull for some additional daily inspiration or direction. 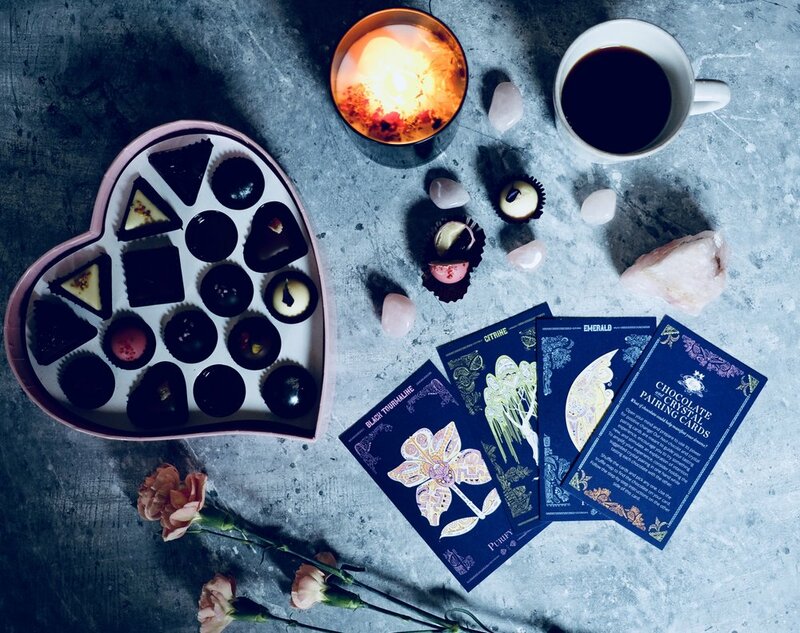 However, Vosges introduced a whole new element that I hadn’t even thought of—pairing crystals and chocolate for purposes of meditation and reflection in a sensuous experience through tasting and touch. Vosges released a collection of chocolates around Valentine’s Day called Cosmic Heart. It comes in a purple velvet, heart-shaped box. Inside is an assortment of delectable bite-sized truffles with botanical and sugar adorned treats with names like—Enchanted Mushroom, Sveta Sofia, Ruby Cerise, Funk & Disco Goddess, and Red Fire. Pictured here Vosges Cosmic Heart Chocolate collection, Crystal Pairing cards & MARVEL + MOON Tenth Muse candle. There is an additional card designated to guide you through the tasting and pairing experience. The card advises that one way to amplify the experience is to hold the suggested crystal in one hand while holding one chocolate in the other. You shuffle your cards, pick one, and use the interior truffle map (similar to the visual key you find in the underside lid of a Russell Stover box letting you know what’s what) to find that chocolate it is paired with. "Sit in a quiet place. Close your eyes and take three deep breaths. As you open your eyes notice your mind has quieted and your senses are piqued. If you are magnifying your experience with crystals, hold the pairing crystal in one hand. Be sure to eat your chocolate with the other hand. Feel the texture, smell the stone, exhale over it as a gesture of gratitude. Hold the stone to your heart and feel the vibrations. Each pairing card goes more in-depth with a series of questions to prompt some daily introspection. I was mesmerized by the experience. I never really thought to add crystals to my morning routine in this way—mainly smelling them. Okay, maybe it seems a little strange, but it does add a whole new layer to the sensory experience. I had never smelled my stones before. Never even thought of it. And, yes, my citrine did have a noticeably different scent. With this guided pairing, I focused on my chocolate truffle with even more intent than before. I ate it slower than I normally would rather than just gulping it down. Yes, I do savor good chocolates, but this experience was so much more intense when truly slowing down and being present and really paying attention to the chocolate in relation to the citrine I held in my hand. Now if you choose to try something similar on your own, of course, you don’t need Vosges’ pairing cards or chocolate to do this. You can create your own experience with your favorite stone or crystal. And if chocolate and/or coffee is not your thing, then I invite you to replace it with a small bite and sip of something that stimulates you. Again, in the nature of hearthcraft, I invite you to look at a seemingly mundane daily ritual with more focus and concentrate on the existing ceremony of it all. Maybe you don’t drink coffee or tea. Maybe your ceremonious morning ritual is an elaborate shower or make-up regiment. Maybe it’s stretching before a jog. Maybe it’s lovingly packing your children’s lunches for school or playing a round of fetch with your pup or brushing your cat. What’s intuitive to you in the mornings? Maybe you don’t even notice and that’s what hearthcraft is asking you to do. Notice, appreciate and be present in your actions, your home, and your body. Take the small win of that first daily ritual. Feel the pleasure of it. It could be the first step in ruling the day. I do. I have to. It keeps me going. Now, if you do want to try my specific ritual and are the type of person who likes a little guidance, I included a version of my morning detailed below. If you feel like you’re good and taking this in and trying it out is too much and you can’t do anything thing. I get it. No worries, friend. You focus on you, the things you already do. No need to continue reading any further. But if you are curious about trying something different then I’ve concocted up a little something for you to follow. Adjust where you need when to comes to drink, treat, and stone. Remember use what you like and what you already have. If you don’t have a crystal or stone, use another object at home you find meaningful. Maybe you will begin to see this object in a new light after this ritual? Or, pluck a stone from the yard if you want. If you don’t have matches, use a lighter. Use what’s handy. The important thing here is being present. But if you are using this ritual as justification for snagging a chocolate bar or two next time you go grocery shopping, you have my ENTIRE support. Vosges Chocolate + Crystal Pairing cards. · Brew your coffee as you normally would. Pay attention to the steps. What do you do first? What is most important to you? Do you look forward to grabbing your favorite mug down from the shelf? What does this process make you feel? Try smelling and feeling the beans/grounds before adding them to the filter. What particular scents arise? Do these scents remind you of a particular memory—a person, place, or time in your life? · When the coffee is done and you have poured it in your favorite mug, collect it, your chocolate, crystal, and candle and head over to kitchen table. Arrange your objects in a pleasing manner to you. Pause for a minute or two and visually take in the beauty of your items. They are simple, yet beautiful, aren't they? · Take a deep breath. · Grab your match and strike. Think of the swift purpose of the strike. Imagine that action carrying throughout the day. What is just ONE thing you want to accomplish or begin today? What is the ONE thing, be it a task, thought, or even a feeling, you will ignite today? Light your candle. · Sit for a minute and watch the flame. Watch as the wax slowly begins to melt and pool from the heat. What fragrances come to you first? How does the flame grow? If you are burning a MARVEL + MOON candle, which topical adornment shifts first? Do they spark a little in the flame and emit any additional scents? Do those scents bring to mind any memories? Does the stone atop the candle slide quickly to the center or does it stay put for a while, content in its position? · Take your chosen crystal or stone in your hand. Bring it to your face. Smell it. What does it smell like? Hold it to your cheek. Is it cool or warm to the touch? Feel its weight—its heft or its smallness. Does its shape remind you of anything? Why did you choose this particular crystal or stone or object? If it was purely intuitive, what was your first reaction when picking it up? If you have prior knowledge of the crystal/stone’s attributes and chose it for those attributes, was it because you need more or less of those qualities in your life right now? · Take your mug of coffee and bring it to your nose. What does it smell like? Does it smell like the beans/grounds from the earlier pre-brew? Or does it now take on a different scent altogether? Take a sip of your coffee. What emotions come to your first? Are you invigorated or comforted? What specific tasting notes arise as you sip? · When ready, set your coffee down and pick up your chocolate. Look at it—really look at it. Is there etched artwork on the surface? If so, what is it? Why is it there? Are there other ingredients like nuts or fruit or flowers or large granules of salt atop? What does the visual element of the treat do to your expectation or anticipation of how it will taste? Smell it. Savor the smell. · Take a bite. Close your eyes. Let the taste unfold in your mouth, cover your tongue and coat your taste buds. How does it coat your tongue—where does it travel first? What’s your favorite part of the chocolate? Is it the snap of the chocolate as you bite down with your teeth—the sound it makes? Is it the first melt and the instant gratification of the sugar or salt? Is it holding the chocolate in your mouth melting it down to just the nuts or fruit and then savoring those all on their own? Set an intention for yourself and day, if you so desire, and meditate on that intention with each bite, imagine it spreading throughout your body with love, purpose, and warmth. · Take your time and enjoy the sensory experience. Alternate between bites and sips. Return to smelling your crystal or stone, feeling it in your hand or against your cheek. Focus on the candle, noting the dance of the flame, and the wave of fragrance as you relish the taste of the chocolate and coffee. Breathe. Breathe. Breathe. This moment is beautiful. This moment is just for you. There doesn’t have to be an expectation that this ritual or experience has to do anything other than provide you with a moment of pleasure and pause. Maybe you set an intention, maybe you didn’t. That’s okay. You can just enjoy what you experienced. It can be a moment to reflect and slow down and enjoy a common routine with more focused concentration and a new appreciation or perspective. The pause is the ceremony. The pause is the magick.